The most acute conflict within Israeli society is the one between secular and ultra-Orthodox, far surpassing all other domestic tensions. 71% view this as the most or second most acute tension in Israeli society, compared with 41% identifying the tension between the political left and right as the most acute, 33% identifying the conflict between rich and poor, and 16% identifying the conflict between Ashkenazi and Sephardic community as the most acute. 64 % of the public, including 56% of religious Jews, support making segregation of women in the public domain a criminal offence. 78 % support reducing public funding for yeshivas and large families in order to encourage Haredi males to enter the workforce. 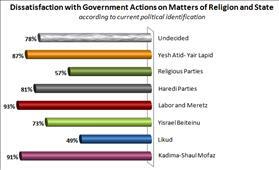 65 % resent the decisive influence that Haredi parties have on matters of religion and state. 61 % of secular Jews said that they are more likely to vote for a party in the upcoming election if it actively supported freedom of religion. 83 % holds that yeshiva students should be obligated to serve in either military or civil service. 72 % reject the claim of Haredi parties that study in yeshivas, not service in the military, ensures Israel’s safety. Click here for charts and further findings of the report. "The study proves that the public wants Judaism, but a Judaism that is free of coercion. It demonstrates how unsubstantiated and pretentious is the claim of the ultra-Orthodox parties that they represent Judaism and Jewish interests. In actuality, these parties are undermining Judaism by linking it with political coercion, corruption, extremism, and thereby distancing the general public from Judaism and the Jewish People from Israel. There is no greater enemy to Judaism and the Jewish People than the ultra-Orthodox parties, and the government’s continued surrender to their demands." "Once again, the Index reveals the unacceptable gap between the positions of the public which desires freedom of religion and equality in shouldering civic burdens, and the government coalition’s positions, which avoid any confrontation with the ultra-Orthodox parties. The public wants equal military service for all, the implementation of core curricular studies, civil marriage, public transportation on Shabbat, a decrease in subsidies for yeshiva students, and action against public discrimination of women. Instead, the public suffers from the governments repeated surrender to the ultra-Orthodox parties Shas and United Torah Judaism." The 2012 Israel Religion and State Index was conducted by the Rafi Smith Research Institute. The Index is based on telephone polling of an expanded sample of 800 participants representing the adult Jewish population in Israel, conducted between July 31st and August 6, 2012. The Index monitors and enables analysis of trends in Israeli public opinion on matters of religion and state.